Are you or do you think you are LGBTQ+? Are you struggling with your sexuality, gender identity, and/or gender expression? Do you want to talk to someone confidentially about your personal concerns, LGBT life at USC, and/or how to get involved with the LGBT community? Are you dealing with difficult challenges in your life? If so, become a mentee in the LGBT Peer Mentoring Program (est. 1993) and work with a caring, dynamic peer mentor on personal, social, academic, career and lifestyle goals! 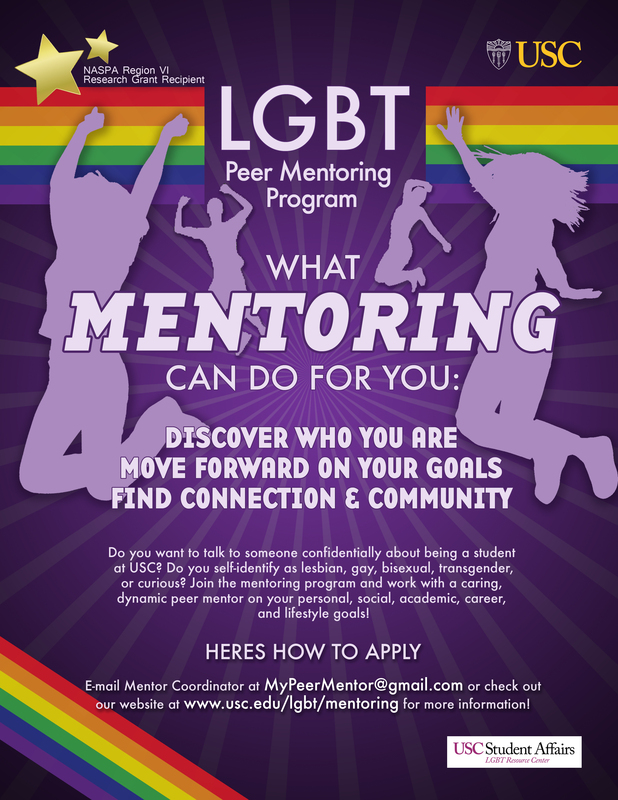 If you are secure in your sense of identity and want to help others in difficult situations, then become a mentor in the LGBT Peer Mentoring Program. or email lgbt@usc.edu with questions. Develop a strong sense of their sexual identity, gender identity, and/or gender expression. Accomplish at least two personal goals while in the program. Identify at least three LGBT supportive resources at USC. In 2010, the LGBT Resource Center’s LGBT Peer Mentoring Program received an assessment grant from NASPA Region VI to conduct an assessment of the mentees focusing on four development areas.